23 March 2010, at 9:42a.m. 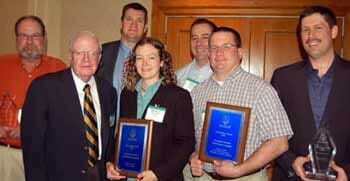 US - American Proteins and Wayne Farms have won US Poultry & Egg Association's 2010 Clean Water Awards. Perdue Farms and Tyson Foods received an honourable mention. American Proteins (Hanceville, Alabama) and Wayne Farms (Decatur, Alabama) have won US Poultry & Egg Association's 2010 Clean Water Awards. Perdue Farms (Perry, Georgia) and Tyson Foods (Wilkesboro, North Carolina) received honourable mention. Presented annually, the awards recognise excellence in the operation of wastewater treatment plants. The presentations were made during the Association's Environmental Management Seminar in New Orleans. Awards are presented in two categories, full treatment and pre-treatment. The full treatment category covers facilities that fully reclaim wastewater prior to discharge into a receiving stream or final land application system. The pre-treatment category includes facilities that discharge pre-treated effluent to publicly-owned full treatment facilities. First place and honourable mention are recognised in both categories. American Proteins won first place in the full treatment category. It is the largest poultry product recycling facility in the world. American Proteins operates on an Environmental Management System, a formal set of procedures and policies. A cover over their anaerobic lagoon reduces odour emissions and provides for the recovery and reuse of biogas for use in boilers. Through an aggressive water conservation programme, 30 million gallons of water are recycled every day. Situated on 600 acres, the facility uses 100 acres, leaving 500 acres for wildlife habitat. American Proteins, Hanceville, also won the award in 2004. Wayne Farms' Decatur further processing facility was selected as the winner in the pre-treatment category, after being runner-up last year. Several innovative processes were recognized: a combined waste stream from two plants improving effluent water quality, an automated jar testing project, polymer blend consistency, and multiple supervisory control and data acquisition, providing 24-7 coverage for both utilities and wastewater treatment. Perdue Farms received honourable mention for full treatment for their slaughter and further processing operations in Perry, Georgia. The water treatment process uses a three-polymer system in a dissolved air flotation unit and a PLC system to control polymer dosing. The system enhances effluent quality and streamlines management control. The facility is located on 700 rural acres, with approximately 350 acres set aside for wildlife habitat conservation. The Tyson Foods Fresh Retail Division in Wilkesboro, North Carolina won honourable mention in the pre-treatment category. The complex includes the processing plant with a capacity of 1.65 million birds per week and a food service plant. The environmental management team works closely with the city of Wilkesboro. Tyson has adapted the latest water treatment innovations in a limited space, and they use effective storm water management techniques. The water conservation programme results in the recycling of one million gallons of water. USPOULTRY chairman, Steve Willardsen from Cargill Value Added Meats in Wichita, Kansas, said: "The poultry industry is recognised as a leader in protecting our natural resources." US Poultry &&Egg Association continues to emphasise environmental stewardship by recognizing excellence in environmental programs at our member companies. We also offer technical assistance and training in environmental management. Congratulations to these four companies for their excellent work." USPOULTRY's 2010 Clean Water Awards were presented at this year's Environmental Management Seminar: (front row from left) Jim Walsh, Georgia Tech, selection committee; Melissa Molaison, Perdue Farms, honorable mention, full treatment; Jamie Burr, Tyson Foods, honorable mention, pretreatment; (back row from left) Alan Vogt, American Proteins, winner, full treatment; Brian Kiepper, University of Georgia, selection committee; Jimmy Mardis, Tyson Foods; and Jesse Fletcher, Wayne Farms, winner, pretreatment.